Abstract: Contrary to popular assumption, DRAMs used in most modern computers retain their contents for several seconds after power is lost, even at room temperature and even if removed from a motherboard. Although DRAMs become less reliable when they are not refreshed, they are not immediately erased, and their contents persist sufficiently for malicious (or forensic) acquisition of usable full-system memory images. We show that this phenomenon limits the ability of an operating system to protect cryptographic key material from an attacker with physical access. We use cold reboots to mount successful attacks on popular disk encryption systems using no special devices or materials. We experimentally characterize the extent and predictability of memory remanence and report that remanence times can be increased dramatically with simple cooling techniques. We offer new algorithms for finding cryptographic keys in memory images and for correcting errors caused by bit decay. Though we discuss several strategies for partially mitigating these risks, we know of no simple remedy that would eliminate them. Most security experts assume that a computer's memory is erased almost immediately when it loses power, or that whatever data remains is difficult to retrieve without specialized equipment. We show that these assumptions are incorrect. Ordinary DRAMs typically lose their contents gradually over a period of seconds, even at standard operating temperatures and even if the chips are removed from the motherboard, and data will persist for minutes or even hours if the chips are kept at low temperatures. 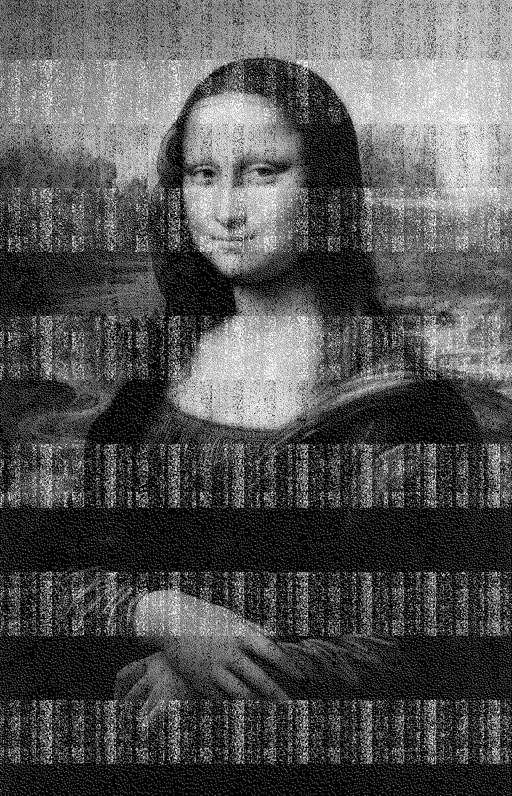 Residual data can be recovered using simple, nondestructive techniques that require only momentary physical access to the machine. We present a suite of attacks that exploit DRAM remanence effects to recover cryptographic keys held in memory. They pose a particular threat to laptop users who rely on disk encryption products, since an adversary who steals a laptop while an encrypted disk is mounted could employ our attacks to access the contents, even if the computer is screen-locked or suspended. We demonstrate this risk by defeating several popular disk encryption systems, including BitLocker, TrueCrypt, and FileVault, and we expect many similar products are also vulnerable. While our principal focus is disk encryption, any sensitive data present in memory when an attacker gains physical access to the system could be subject to attack. Many other security systems are probably vulnerable. For example, we found that Mac OS X leaves the user's login password in memory, where we were able to recover it, and we have constructed attacks for extracting RSA private keys from Apache web servers. As we discuss in Section 2, certain segments of the computer security and semiconductor physics communities have been conscious of DRAM remanence effects for some time, though strikingly little about them has been published. As a result, many who design, deploy, or rely on secure systems are unaware of these phenomena or the ease with which they can be exploited. To our knowledge, ours is the first comprehensive study of their security consequences. Highlights and roadmap In Section 3, we describe experiments that we conducted to characterize DRAM remanence in a variety of memory technologies. Contrary to the expectation that DRAM loses its state quickly if it is not regularly refreshed, we found that most DRAM modules retained much of their state without refresh, and even without power, for periods lasting thousands of refresh intervals. At normal operating temperatures, we generally saw a low rate of bit corruption for several seconds, followed by a period of rapid decay. Newer memory technologies, which use higher circuit densities, tended to decay more quickly than older ones. In most cases, we observed that almost all bits decayed at predictable times and to predictable “ground states” rather than to random values. We also confirmed that decay rates vary dramatically with temperature. We obtained surface temperatures of approximately −50 ∘C with a simple cooling technique: discharging inverted cans of “canned air” duster spray directly onto the chips. At these temperatures, we typically found that fewer than 1% of bits decayed even after 10 minutes without power. To test the limits of this effect, we submerged DRAM modules in liquid nitrogen (ca. −196 ∘C) and saw decay of only 0.17% after 60 minutes out of the computer. In Section 4, we present several attacks that exploit DRAM remanence to acquire memory images from which keys and other sensitive data can be extracted. Our attacks come in three variants, of increasing resistance to countermeasures. The simplest is to reboot the machine and launch a custom kernel with a small memory footprint that gives the adversary access to the retained memory. A more advanced attack briefly cuts power to the machine, then restores power and boots a custom kernel; this deprives the operating system of any opportunity to scrub memory before shutting down. An even stronger attack cuts the power and then transplants the DRAM modules to a second PC prepared by the attacker, which extracts their state. This attack additionally deprives the original BIOS and PC hardware of any chance to clear the memory on boot. We have implemented imaging kernels for use with network booting or a USB drive. If the attacker is forced to cut power to the memory for too long, the data will become corrupted. We propose three methods for reducing corruption and for correcting errors in recovered encryption keys. The first is to cool the memory chips prior to cutting power, which dramatically reduces the error rate. The second is to apply algorithms we have developed for correcting errors in private and symmetric keys. The third is to replicate the physical conditions under which the data was recovered and experimentally measure the decay properties of each memory location; with this information, the attacker can conduct an accelerated error correction procedure. These techniques can be used alone or in combination. In Section 5, we explore the second error correction method: novel algorithms that can reconstruct cryptographic keys even with relatively high bit-error rates. Rather than attacking the key directly, our methods consider values derived from it, such as key schedules, that provide a higher degree of redundancy. For performance reasons, many applications precompute these values and keep them in memory for as long as the key itself is in use. To reconstruct an AES key, for example, we treat the decayed key schedule as an error correcting code and find the most likely values for the original key. Applying this method to keys with 10% of bits decayed, we can reconstruct nearly any 128-bit AES key within a few seconds. We have devised reconstruction techniques for AES, DES, and RSA keys, and we expect that similar approaches will be possible for other cryptosystems. The vulnerability of precomputation products to such attacks suggests an interesting trade-off between efficiency and security. In Section 6, we present fully automatic techniques for identifying such keys from memory images, even in the presence of bit errors. We demonstrate the effectiveness of these attacks in Section 7 by attacking several widely used disk encryption products, including BitLocker, TrueCrypt, and FileVault. We have developed a fully automated demonstration attack against BitLocker that allows access to the contents of the disk with only a few minutes of computation. Notably, using BitLocker with a Trusted Platform Module (TPM) sometimes makes it less secure, allowing an attacker to gain access to the data even if the machine is stolen while it is completely powered off. It may be difficult to prevent all the attacks that we describe even with significant changes to the way encryption products are designed and used, but in practice there are a number of safeguards that can provide partial resistance. In Section 8, we suggest a variety of mitigation strategies ranging from methods that average users can apply today to long-term software and hardware changes. Each remedy has limitations and trade-offs. As we conclude in Section 9, it seems there is no simple fix for DRAM remanence vulnerabilities. Online resources A video demonstration of our attacks and source code for some of our tools are available at http://citp.princeton.edu/memory. Previous researchers have suggested that data in DRAM might survive reboots, and that this fact might have security implications. To our knowledge, however, ours is the first security study to focus on this phenomenon, the first to consider how to reconstruct symmetric keys in the presence of errors, the first to apply such attacks to real disk encryption systems, and the first to offer a systematic discussion of countermeasures. We owe the suggestion that modern DRAM contents can survive cold boot to Pettersson [ 33 ], who seems to have obtained it from Chow, Pfaff, Garfinkel, and Rosenblum [ 13 ]. Pettersson suggested that remanence across cold boot could be used to acquire forensic memory images and obtain cryptographic keys, although he did not experiment with the possibility. Chow et al. discovered this property in the course of an experiment on data lifetime in running systems. While they did not exploit the property, they remark on the negative security implications of relying on a reboot to clear memory. In a recent presentation, MacIver [ 31 ] stated that Microsoft considered memory remanence attacks in designing its BitLocker disk encryption system. He acknowledged that BitLocker is vulnerable to having keys extracted by cold-booting a machine when it is used in “basic mode” (where the encrypted disk is mounted automatically without requiring a user to enter any secrets), but he asserted that BitLocker is not vulnerable in “advanced modes” (where a user must provide key material to access the volume). He also discussed cooling memory with dry ice to extend the retention time. MacIver apparently has not published on this subject. Anderson cites Skorobogatov [ 40 ], who found significant data retention times with static RAMs at room temperature. Our results for modern DRAMs show even longer retention in some cases. Anderson's main focus is on “burn-in" effects that occur when data is stored in RAM for an extended period. Gutmann [ 22 , 23 ] also examines “burn-in,” which he attributes to physical changes that occur in semiconductor memories when the same value is stored in a cell for a long time. Accordingly, Gutmann suggests that keys should not be stored in one memory location for longer than several minutes. Our findings concern a different phenomenon: the remanence effects we have studied occur in modern DRAMs even when data is stored only momentarily. These effects do not result from the kind of physical changes that Gutmann described, but rather from the capacitance of DRAM cells. Other methods for obtaining memory images from live systems include using privileged software running under the host operating system [ 43 ], or using DMA transfer on an external bus [ 19 ], such as PCI [ 12 ], mini-PCI, Firewire [ 8 , 15 , 16 ], or PC Card. Unlike these techniques, our attacks do not require access to a privileged account on the target system, they do not require specialized hardware, and they are resistant to operating system countermeasures. A DRAM cell is essentially a capacitor. Each cell encodes a single bit by either charging or not charging one of the capacitor's conductors. The other conductor is hard-wired either to power or to ground, depending on the cell's address within the chip [ 37 , 23 ]. Over time, charge will leak out of the capacitor, and the cell will lose its state or, more precisely, it will decay to its ground state, either zero or one depending on whether the fixed conductor of the capacitor is hard-wired to ground or power. To forestall this decay, the cell must be refreshed, meaning that the capacitor must be re-charged to hold its value. Specifications for DRAM chips give a refresh time, which is the maximum interval that is supposed to pass before a cell is refreshed. The standard refresh time (usually on the order of milliseconds) is meant to achieve extremely high reliability for normal computer operations where even infrequent bit errors could cause serious problems; however, a failure to refresh any individual DRAM cell within this time has only a tiny probability of actually destroying the cell's contents. We conducted a series of experiments to characterize DRAM remanence effects and better understand the security properties of modern memories. We performed trials using PC systems with different memory technologies, as shown in Table 1. These systems included models from several manufacturers and ranged in age from 9 years to 6 months. Using a modified version of our PXE memory imaging program (see Section 4.1), we filled representative memory regions with a pseudorandom pattern. We read back these memory regions after varying periods of time without refresh and under different temperature conditions, and measured the error rate of each sample. The error rate is the number of bit errors in each sample (the Hamming distance from the pattern we had written) divided by the total number of bits we measured. Since our pseudorandom test pattern contained roughly equal numbers of zeros and ones, we would expect fully decayed memory to have an error rate of approximately 50% . Our first tests measured the decay rate of each memory module under normal operating temperature, which ranged from 25.5 ∘C to 44.1 ∘C, depending on the machine (see Figures 1, 2, and 3). 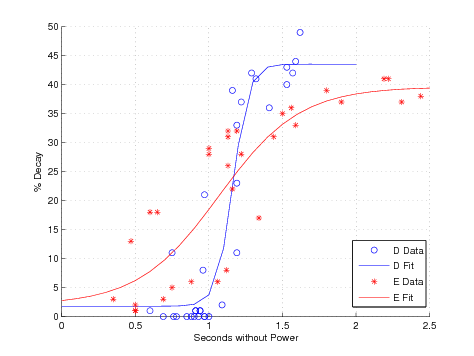 We found that the dimensions of the decay curves varied considerably between machines, with the fastest exhibiting complete data loss in approximately 2.5 seconds and the slowest taking an average of 35 seconds. However, the decay curves all display a similar shape, with an initial period of slow decay, followed by an intermediate period of rapid decay, and then a final period of slow decay. 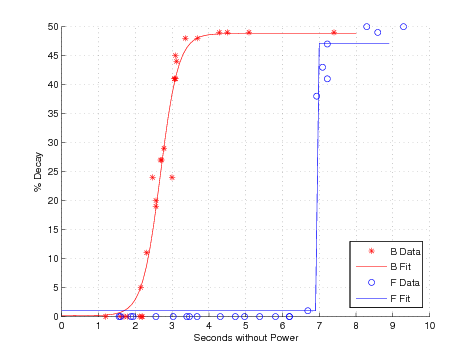 We calculated best fit curves to the data using the logistic function because MOSFETs, the basic components of a DRAM cell, exhibit a logistic decay curve. We found that machines using newer memory technologies tend to exhibit a shorter time to total decay than machines using older memory technologies, but even the shorter times are long enough to facilitate most of our attacks. We ascribe this trend to the increasing density of the DRAM cells as the technology improves; in general, memory with higher densities have a shorter window where data is recoverable. While this trend might make DRAM retention attacks more difficult in the future, manufacturers also generally seek to increase retention times, because DRAMs with long retention require less frequent refresh and have lower power consumption. It has long been known that low temperatures can significantly increase memory devices' retention times [ 29 , 2 , 46 , 23 , 41 , 40 ]. To measure this effect, we performed a second series of tests using machines A–D. In each trial, we loaded a pseudorandom test pattern into memory, and, with the computer running, cooled the memory module to approximately −50 ∘C. We then powered off the machine and maintained this temperature until power was restored. We achieved these temperatures using commonly available “canned air” duster products (see Section 4.2), which we discharged, with the can inverted, directly onto the chips. As expected, we observed a significantly lower rate of decay under these reduced temperatures (see Table 2). 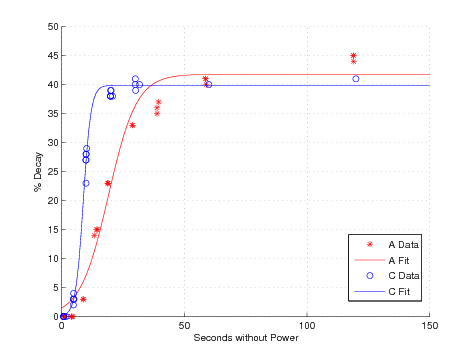 On all of our sample DRAMs, the decay rates were low enough that an attacker who cut power for 60 seconds would recover 99.9% of bits correctly. As an extreme test of memory cooling, we performed another experiment using liquid nitrogen as an additional cooling agent. We first cooled the memory module of Machine A to −50 ∘C using the “canned air” product. We then cut power to the machine, and quickly removed the DRAM module and placed it in a canister of liquid nitrogen. We kept the memory module submerged in the liquid nitrogen for 60 minutes, then returned it to the machine. We measured only 14,000 bit errors within a 1 MB test region (0.17% decay). This suggests that, even in modern memory modules, data may be recoverable for hours or days with sufficient cooling. We observed that the DRAMs we studied tended to decay in highly nonuniform patterns. While these patterns varied from chip to chip, they were very predictable in most of the systems we tested. Figure 4 shows the decay in one memory region from Machine A after progressively longer intervals without power. There seem to be several components to the decay patterns. The most prominent is a gradual decay to the “ground state” as charge leaks out of the memory cells. In the DRAM shown in Figure 4, blocks of cells alternate between a ground state of 0 and a ground state of 1, resulting in the series of horizontal bars. Other DRAM models and other regions within this DRAM exhibited different ground states, depending on how the cells are wired. We observed a small number of cells that deviated from the “ground state” pattern, possibly due to manufacturing variation. In experiments with 20 or 40 runs, a few “retrograde” cells (typically ∼ 0.05% of memory cells, but larger in a few devices) always decayed to the opposite value of the one predicted by the surrounding ground state pattern. An even smaller number of cells decayed in different directions across runs, with varying probabilities. Figure 4: We loaded a bitmap image into memory on Machine A, then cut power for varying lengths of time. 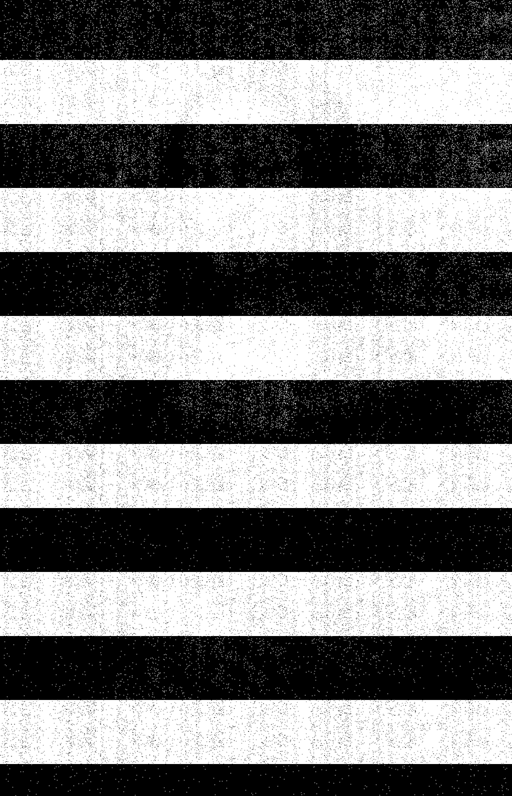 After 5 seconds (left), the image is indistinguishable from the original. It gradually becomes more degraded, as shown after 30 seconds, 60 seconds, and 5 minutes. Apart from their eventual states, the order in which different cells decayed also appeared to be highly predictable. At a fixed temperature, each cell seems to decay after a consistent length of time without power. The relative order in which the cells decayed was largely fixed, even as the decay times were changed by varying the temperature. This may also be a result of manufacturing variations, which result in some cells leaking charge faster than others. To visualize this effect, we captured degraded memory images, including those shown in Figure 4, after cutting power for intervals ranging from 1 second to 5 minutes, in 1 second increments. We combined the results into a video (available on our web site). Each test interval began with the original image freshly loaded into memory. We might have expected to see a large amount of variation between frames, but instead, most bits appear stable from frame to frame, switching values only once, after the cell's decay interval. The video also shows that the decay intervals themselves follow higher order patterns, likely related to the physical geometry of the DRAM. Even if memory contents remain intact while power is off, the system BIOS may overwrite portions of memory when the machine boots. In the systems we tested, the BIOS overwrote only relatively small fractions of memory with its own code and data, typically a few megabytes concentrated around the bottom of the address space. On many machines, the BIOS can perform a destructive memory check during its Power-On Self Test (POST). Most of the machines we examined allowed this test to be disabled or bypassed (sometimes by enabling an option called “Quick Boot”). On other machines, mainly high-end desktops and servers that support ECC memory, we found that the BIOS cleared memory contents without any override option. ECC memory must be set to a known state to avoid spurious errors if memory is read without being initialized , and we believe many ECC-capable systems perform this wiping operation whether or not ECC memory is installed. ECC DRAMs are not immune to retention effects, and an attacker could transfer them to a non-ECC machine that does not wipe its memory on boot. Indeed, ECC memory could turn out to help the attacker by making DRAM more resistant to bit errors. Imaging residual memory contents requires no special equipment. When the system boots, the memory controller begins refreshing the DRAM, reading and rewriting each bit value. At this point, the values are fixed, decay halts, and programs running on the system can read any data present using normal memory-access instructions. One challenge is that booting the system will necessarily overwrite some portions of memory. Loading a full operating system would be very destructive. Our approach is to use tiny special-purpose programs that, when booted from either a warm or cold reset state, produce accurate dumps of memory contents to some external medium. These programs use only trivial amounts of RAM, and their memory offsets used can be adjusted to some extent to ensure that data structures of interest are unaffected. Our memory-imaging tools make use of several different attack vectors to boot a system and extract the contents of its memory. For simplicity, each saves memory images to the medium from which it was booted. PXE network boot Most modern PCs support network booting via Intel's Preboot Execution Environment (PXE) [ 25 ], which provides rudimentary startup and network services. We implemented a tiny (9 KB) standalone application that can be booted via PXE and whose only function is streaming the contents of system RAM via a UDP-based protocol. Since PXE provides a universal API for accessing the underlying network hardware, the same binary image will work unmodified on any PC system with PXE support. In a typical attack setup, a laptop connected to the target machine via an Ethernet crossover cable runs DHCP and TFTP servers as well as a simple client application for receiving the memory data. We have extracted memory images at rates up to 300 Mb/s (around 30 seconds for a 1 GB RAM) with gigabit Ethernet cards. Figure 5: Before powering off the computer, we spray an upside-down canister of multipurpose duster directly onto the memory chips, cooling them to −50 ∘C. At this temperature, the data will persist for several minutes after power loss with minimal error, even if we remove the DIMM from the computer. USB drives Alternatively, most PCs can boot from an external USB device such as a USB hard drive or flash device. We implemented a small (10 KB) plug-in for the SYSLINUX bootloader [ 3 ] that can be booted from an external USB device or a regular hard disk. It saves the contents of system RAM into a designated data partition on this device. We succeeded in dumping 1 GB of RAM to a flash drive in approximately 4 minutes. EFI boot Some recent computers, including all Intel-based Macintosh computers, implement the Extensible Firmware Interface (EFI) instead of a PC BIOS. We have also implemented a memory dumper as an EFI netboot application. We have achieved memory extraction speeds up to 136 Mb/s, and we expect it will be possible to increase this throughput with further optimizations. iPods We have installed memory imaging tools on an Apple iPod so that it can be used to covertly capture memory dumps without impacting its functionality as a music player. This provides a plausible way to conceal the attack in the wild. An attacker could use imaging tools like ours in a number of ways, depending on his level of access to the system and the countermeasures employed by hardware and software. Simple reboots The simplest attack is to reboot the machine and configure the BIOS to boot the imaging tool. A warm boot, invoked with the operating system's restart procedure, will normally ensure that the memory has no chance to decay, though software will have an opportunity to wipe sensitive data prior to shutdown. A cold boot, initiated using the system's restart switch or by briefly removing and restoring power, will result in little or no decay depending on the memory's retention time. Restarting the system in this way denies the operating system and applications any chance to scrub memory before shutting down. Transferring DRAM modules Even if an attacker cannot force a target system to boot memory-imaging tools, or if the target employs countermeasures that erase memory contents during boot, DIMM modules can be physically removed and their contents imaged using another computer selected by the attacker. Some memory modules exhibit far faster decay than others, but as we discuss in Section 3.2 above, cooling a module before powering it off can slow decay sufficiently to allow it to be transferred to another machine with minimal decay. Widely-available “canned air” dusters, usually containing a compressed fluorohydrocarbon refrigerant, can easily be used for this purpose. When the can is discharged in an inverted position, as shown in Figure 5, it dispenses its contents in liquid form instead of as a gas. The rapid drop in pressure inside the can lowers the temperature of the discharge, and the subsequent evaporation of the refrigerant causes a further chilling. By spraying the contents directly onto memory chips, we can cool their surfaces to −50 ∘C and below. If the DRAM is cooled to this temperature before power is cut and kept cold, we can achieve nearly lossless data recovery even after the chip is out of the computer for several minutes. Removing the memory modules can also allow the attacker to image memory in address regions where standards BIOSes load their own code during boot. The attacker could remove the primary memory module from the target machine and place it into the secondary DIMM slot (in the same machine or another machine), effectively remapping the data to be imaged into a different part of the address space. Our experiments (see Section 3) show that it is possible to recover memory contents with few bit errors even after cutting power to the system for a brief time, but the presence of even a small amount of error complicates the process of extracting correct cryptographic keys. In this section we present algorithms for correcting errors in symmetric and private keys. These algorithms can correct most errors quickly even in the presence of relatively high bit error probabilities in the range of 5% to 50%, depending on the type of key. A naïve approach to key error correction is to brute-force search over keys with a low Hamming distance from the decayed key that was retrieved from memory, but this is computationally burdensome even with a moderate amount of unidirectional error. As an example, if only 10% of the ones have decayed to zeros in our memory image, the data recovered from a 256-bit key with an equal number of ones and zeroes has an expected Hamming distance of 12 from the actual key, and the number of such keys is 128 + 12 12 > 256. Our algorithms achieve significantly better performance by considering data other than the raw form of the key. Most encryption programs speed up computation by storing data precomputed from the encryption keys—for block ciphers, this is most often a key schedule, with subkeys for each round; for RSA, this is an extended form of the private key which includes the primes p and q and several other values derived from d. This data contains much more structure than the key itself, and we can use this structure to efficiently reconstruct the original key even in the presence of errors. These results imply an interesting trade-off between efficiency and security. All of the disk encryption systems we studied (see Section 7) precompute key schedules and keep them in memory for as long as the encrypted disk is mounted. While this practice saves some computation for each disk block that needs to be encrypted or decrypted, we find that it greatly simplifies key recovery attacks. Our approach to key reconstruction has the advantage that it is completely self-contained, in that we can recover the key without having to test the decryption of ciphertext. The data derived from the key, and not the decoded plaintext, provides a certificate of the likelihood that we have found the correct key. We have found it useful to adopt terminology from coding theory. We may imagine that the expanded key schedule forms a sort of error correcting code for the key, and the problem of reconstructing a key from memory may be recast as the problem of finding the closest code word (valid key schedule) to the data once it has been passed through a channel that has introduced bit errors. If we assume we have no knowledge of the decay patterns other than the ground state, we can model the decay with the binary asymmetric channel, in which the probability of a 1 flipping to 0 is some fixed δ0 and the probability of a 0 flipping to a 1 is some fixed δ1. In practice, the probability of decaying to the ground state approaches 1 as time goes on, while the probability of flipping in the opposite direction remains relatively constant and tiny (less than 0.1% in our tests). The ground state decay probability can be approximated from recovered key data by counting the fraction of 1s and 0s, assuming that the original key data contained roughly equal proportions of each value. We also observed that bits tended to decay in a predictable order that could be learned over a series of timed decay trials, although the actual order of decay appeared fairly random with respect to location. An attacker with the time and physical access to run such a series of tests could easily adapt any of the approaches in this section to take this order into account and improve the performance of the error-correction. Ideally such tests would be able to replicate the conditions of the memory extraction exactly, but knowledge of the decay order combined with an estimate of the fraction of bit flips is enough to give a very good estimate of an individual decay probability of each bit. This probability can be used in our reconstruction algorithms to prioritize guesses. For simplicity and generality, we will analyze the algorithms assuming no knowledge of this decay order. We first apply these methods to develop an error correction technique for DES. The DES key schedule algorithm produces 16 subkeys, each a permutation of a 48-bit subset of bits from the original 56-bit key. Every bit from the original key is repeated in about 14 of the 16 subkeys. For δ0 = .1 and δ1 = .001 (that is, we are in a block with ground state 0), r = .75 and this approach will fail to correctly decode a bit only if more than 3 of the 14 copies of a 0 decay to a 1, or more than 11 of the 14 copies of a 1 decay to 0. The probability of this event is less than 10−9. Applying the union bound, the probability that any of the 56 key bits will be incorrectly decoded is at most 56 × 10−9 < 6 × 10−8; even at 50% error, the probability that the key can be correctly decoded without resorting to brute force search is more than 98%. This technique can be trivially extended to correct errors in Triple DES keys. Since Triple DES applies the same key schedule algorithm to two or three 56-bit key components (depending on the version of Triple DES), the probability of correctly decoding each key bit is the same as for regular DES. With a decay rate of δ0 = .5 and probability δ1 = .001 of bit flips in the opposite direction, we can correctly decode a 112-bit Triple DES key with at least 97% probability and a 168-bit key with at least 96% probability. The AES key schedule has a more complex structure than the DES key schedule, but we can still use it to efficiently reconstruct a key in the presence of errors. A seemingly reasonable approach to this problem would be to search keys in order of distance to the recovered key and output any key whose schedule is sufficiently close to the recovered schedule. Our implementation of this algorithm took twenty minutes to search 109 candidate keys in order to reconstruct a key in which 7 zeros had flipped to ones. At this rate it would take ten days to reconstruct a key with 11 bits flipped. We can do significantly better by taking advantage of the structure of the AES key schedule. Instead of trying to correct an entire key at once, we can examine a smaller set of bytes at a time. The high amount of linearity in the key schedule is what permits this separability—we can take advantage of pieces that are small enough to brute force optimal decodings for, yet large enough that these decodings are useful to reconstruct the overall key. Once we have a list of possible decodings for these smaller pieces of the key in order of likelihood, we can combine them into a full key to check against the key schedule. Since each of the decoding steps is quite fast, the running time of the entire algorithm is ultimately limited by the number of combinations we need to check. The number of combinations is still roughly exponential in the number of errors, but it is a vast improvement over brute force searching and is practical in many realistic cases. Overview of the algorithm For 128-bit keys, an AES key expansion consists of 11 four-word (128-bit) round keys. The first round key is equal to the key itself. Each remaining word of the key schedule is generated either by XORing two words of the key schedule together, or by performing the key schedule core (in which the bytes of a word are rotated and each byte is mapped to a new value) on a word of the key schedule and XORing the result with another word of the key schedule. Consider a “slice” of the first two round keys consisting of byte i from words 1-3 of the first two round keys, and byte i−1 from word 4 of the first round key. This slice is 7 bytes long, but is uniquely determined by the four bytes from the key. In theory, there are still 232 possibilities to examine for each slice, but we can do quite well by examining them in order of distance to the recovered key. For each possible set of 4 key bytes, we generate the relevant three bytes of the next round key and calculate the probability, given estimates of δ0 and δ1, that these seven bytes might have decayed to the corresponding bytes of the recovered round keys. Now we proceed to guess candidate keys, where a candidate contains a value for each slice of bytes. We consider the candidates in order of decreasing total likelihood as calculated above. For each candidate key we consider, we calculate the expanded key schedule and ask if the likelihood of that expanded key schedule decaying to our recovered key schedule is sufficiently high. If so, then we output the corresponding key as a guess. When one of δ0 or δ1 is very small, this algorithm will almost certainly output a unique guess for the key. To see this, observe that a single bit flipped in the key results in a cascade of bit flips through the key schedule, half of which are likely to flip in the “wrong” direction. Our implementation of this algorithm is able to reconstruct keys with 15% error (that is, δ0 = .15 and δ1 = .001) in a fraction of a second, and about half of keys with 30% error within 30 seconds. This idea can be extended to 256-bit keys by dividing the words of the key into two sections—words 1–3 and 8, and words 4–7, for example—then comparing the words of the third and fourth round keys generated by the bytes of these words and combining the result into candidate round keys to check. The same methods can be applied to reconstruct keys for tweakable encryption modes [ 30 ], which are commonly used in disk encryption systems. LRW LRW augments a block cipher E (and key K1) by computing a “tweak” X for each data block and encrypting the block using the formula EK1(P ⊕ X) ⊕ X. A tweak key K2 is used to compute the tweak, X = K2 ⊗ I, where I is the logical block identifier. The operations ⊕ and ⊗ are performed in the finite field GF(2128). In order to speed tweak computations, implementations commonly precompute multiplication tables of the values K2 xi mod P, where x is the primitive element and P is an irreducible polynomial over GF(2128) [ 26 ]. In practice, Q x mod P is computed by shifting the bits of Q left by one and possibly XORing with P.
Given a value K2 xi, we can recover nearly all of the bits of K2 simply by shifting right by i. The number of bits lost depends on i and the nonzero elements of P. An entire multiplication table will contain many copies of nearly all of the bits of K2, allowing us to reconstruct the key in much the same way as the DES key schedule. As an example, we apply this method to reconstruct the LRW key used by the TrueCrypt 4 disk encryption system. TrueCrypt 4 precomputes a 4048-byte multiplication table consisting of 16 blocks of 16 lines of 4 words of 4 bytes each. Line 0 of block 14 contains the tweak key. The multiplication table is generated line by line from the LRW key by iteratively applying the shift-and-XOR multiply function to generate four new values, and then XORing all combinations of these four values to create 16 more lines of the table. The shift-and-XOR operation is performed 64 times to generate the table, using the irreducible polynomial P = x128+x7+x2+x+1. For any of these 64 values, we can shift right i times to recover 128 − (8+i) of the bits of K2, and use these recovered values to reconstruct K2 with high probability. XEX and XTS For XEX [ 35 ] and XTS [ 24 ] modes, the tweak for block j in sector I is X = EK2(I) ⊗ xj, where I is encrypted with AES and x is the primitive element of GF(2128). Assuming the key schedule for K2 is kept in memory, we can use the AES key reconstruction techniques to reconstruct the tweak key. An RSA public key consists of the modulus N and the public exponent e, while the private key consists of the private exponent d and several optional values: prime factors p and q of N, d mod (p−1), d mod (q−1), and q−1 mod p. Given N and e, any of the private values is sufficient to generate the others using the Chinese remainder theorem and greatest common divisor algorithms. In practice, RSA implementations store some or all optional values to speed up computation. There have been a number of results on efficiently reconstructing RSA private keys given a fraction of the bits of private key data. Let n = lgN. N can be factored in polynomial time given the n/4 least significant bits of p (Coppersmith [ 14 ]), given the n/4 least significant bits of d (Boneh, Durfee, and Frankel [ 9 ]), or given the n/4 least significant bits of d mod (p−1) (Blömer and May ). These previous results are all based on Coppersmith's method of finding bounded solutions to polynomial equations using lattice basis reduction; the number of contiguous bits recovered from the most or least significant bits of the private key data determines the additive error tolerated in the solution. In our case, the errors may be distributed across all bits of the key data, so we are searching for solutions with low Hamming weight, and these previous approaches do not seem to be directly applicable. Given the public modulus N and the values p and q recovered from memory, we can deduce values for the original p and q by iteratively reconstructing them from the least-significant bits. For unidirectional decay with probability δ, bits pi and qi are uniquely determined by Ni and our guesses for the i − 1 lower-order bits of p and q (observe that p0 = q0 = 1), except in the case when pi and qi are both in the ground state. This yields a branching process with expected degree (3+ δ)2/8. If decay is not unidirectional, we may use the estimated probabilities to weight the branches at each bit. Combined with a few heuristics—for example, choose the most likely state first, prune nodes by bounds on the solution, and iteratively increase the bit flips allowed—this results in a practical algorithm for reasonable error rates. This process can likely be improved substantially using additional data recovered from the private key. We tested an implementation of the algorithm on a fast modern machine. For fifty trials with 1024-bit primes (2048-bit keys) and δ = 4%, the median reconstruction time was 4.5 seconds. The median number of nodes visited was 16,499, the mean was 621,707, and the standard deviation was 2,136,870. For δ = 6%, reconstruction required a median of 2.5 minutes, or 227,763 nodes visited. For 512-bit primes and δ = 10%, reconstruction required a median of 1 minute, or 188,702 nodes visited. For larger error rates, we can attempt to reconstruct only the first n/4 bits of the key using this process and use the lattice techniques to reconstruct the rest of the key; these computations generally take several hours in practice. For a 1024-bit RSA key, we would need to recover 256 bits of a factor. The expected depth of the tree from our branching reconstruction process would be (1/2 + δ)2 256 (assuming an even distribution of 0s and 1s) and the expected fraction of branches that would need to be examined is 1/2 + δ2. Extracting encryption keys from memory images requires a mechanism for locating the target keys. A simple approach is to test every sequence of bytes to see whether it correctly decrypts some known plaintext. Applying this method to a 1 GB memory image known to contain a 128-bit symmetric key aligned to some 4-byte machine word implies at most 228 possible key values. However, this is only the case if the memory image is perfectly accurate. If there are bit errors in the portion of memory containing the key, the search quickly becomes intractable. We have developed fully automatic techniques for locating symmetric encryption keys in memory images, even in the presence of bit errors. Our approach is similar to the one we used to correct key bit errors in Section 5. We target the key schedule instead of the key itself, searching for blocks of memory that satisfy (or are close to satisfying) the combinatorial properties of a valid key schedule. Using these methods we have been able to recover keys from closed-source encryption programs without having to disassemble them and reconstruct their key data structures, and we have even recovered partial key schedules that had been overwritten by another program when the memory was reallocated. Although previous approaches to key recovery do not require a scheduled key to be present in memory, they have other practical drawbacks that limit their usefulness for our purposes. Shamir and van Someren [ 39 ] propose visual and statistical tests of randomness which can quickly identify regions of memory that might contain key material, but their methods are prone to false positives that complicate testing on decayed memory images. Even perfect copies of memory often contain large blocks of random-looking data that might pass these tests (e.g., compressed files). Pettersson [ 33 ] suggests a plausibility test for locating a particular program data structure that contains key material based on the range of likely values for each field. This approach requires the operator to manually derive search heuristics for each encryption application, and it is not very robust to memory errors. Iterate through each byte of memory. Treat the following block of 176 or 240 bytes of memory as an AES key schedule. For each word in the potential key schedule, calculate the Hamming distance from that word to the key schedule word that should have been generated from the surrounding words. If the total number of bits violating the constraints on a correct AES key schedule is sufficiently small, output the key. We created an application called keyfind that implements this algorithm for 128- and 256-bit AES keys. The program takes a memory image as input and outputs a list of likely keys. It assumes that key schedules are contained in contiguous regions of memory and in the byte order used in the AES specification [ 1 ]; this can be adjusted to target particular cipher implementations. A threshold parameter controls how many bit errors will be tolerated in candidate key schedules. We apply a quick test of entropy to reduce false positives. We expect that this approach can be applied to many other ciphers. For example, to identify DES keys based on their key schedule, calculate the distance from each potential subkey to the permutation of the key. A similar method works to identify the precomputed multiplication tables used for advanced cipher modes like LRW (see Section 5.3). Methods proposed for identifying RSA private keys range from the purely algebraic (Shamir and van Someren suggest, for example, multiplying adjacent key-sized blocks of memory [ 39 ]) to the ad hoc (searching for the RSA Object Identifiers found in ASN.1 key objects [ 34 ]). The former ignores the widespread use of standard key formats, and the latter seems insufficiently robust. The most widely used format for an RSA private key is specified in PKCS #1 [ 36 ] as an ASN.1 object of type RSAPrivateKey with the following fields: version, modulus n, publicExponent e, privateExponent d, prime1 p, prime2 q, exponent1 d mod (p−1), exponent2 d mod (q−1), coefficient q−1 mod p, and optional other information. This object, packaged in DER encoding, is the standard format for storage and interchange of private keys. This format suggests two techniques we might use for identifying RSA keys in memory: we could search for known contents of the fields, or we could look for memory that matches the structure of the DER encoding. We tested both of these approaches on a computer running Apache 2.2.3 with mod_ssl. One value in the key object that an attacker is likely to know is the public modulus. (In the case of a web server, the attacker can obtain this and the rest of the public key by querying the server.) We tried searching for the modulus in memory and found several matches, all of them instances of the server's public or private key. We also tested a key finding method described by Ptacek [ 34 ] and others: searching for the RSA Object Identifiers that should mark ASN.1 key objects. This technique yielded only false positives on our test system. Finally, we experimented with a new method, searching for identifying features of the DER-encoding itself. We looked for the sequence identifier (0x30) followed a few bytes later by the DER encoding of the RSA version number and then by the beginning of the DER encoding of the next field (02 01 00 02). This method found several copies of the server's private key, and no false positives. To locate keys in decayed memory images, we can adapt this technique to search for sequences of bytes with low Hamming distance to these markers and check that the subsequent bytes satisfy some heuristic entropy bound. Encrypting hard drives is an increasingly common countermeasure against data theft, and many users assume that disk encryption products will protect sensitive data even if an attacker has physical access to the machine. A California law adopted in 2002 [ 10 ] requires disclosure of possible compromises of personal information, but offers a safe harbor whenever data was “encrypted.” Though the law does not include any specific technical standards, many observers have recommended the use of full-disk or file system encryption to obtain the benefit of this safe harbor. (At least 38 other states have enacted data breach notification legislation [ 32 ].) Our results below suggest that disk encryption, while valuable, is not necessarily a sufficient defense. We find that a moderately skilled attacker can circumvent many widely used disk encryption products if a laptop is stolen while it is powered on or suspended. We have applied some of the tools developed in this paper to attack popular on-the-fly disk encryption systems. The most time-consuming parts of these tests were generally developing system-specific attacks and setting up the encrypted disks. Actually imaging memory and locating keys took only a few minutes and were almost fully automated by our tools. We expect that most disk encryption systems are vulnerable to such attacks. BitLocker BitLocker, which is included with some versions of Windows Vista, operates as a filter driver that resides between the file system and the disk driver, encrypting and decrypting individual sectors on demand. The keys used to encrypt the disk reside in RAM, in scheduled form, for as long as the disk is mounted. In a paper released by Microsoft, Ferguson [ 21 ] describes BitLocker in enough detail both to discover the roles of the various keys and to program an independent implementation of the BitLocker encryption algorithm without reverse engineering any software. BitLocker uses the same pair of AES keys to encrypt every sector on the disk: a sector pad key and a CBC encryption key. These keys are, in turn, indirectly encrypted by the disk's master key. To encrypt a sector, the plaintext is first XORed with a pad generated by encrypting the byte offset of the sector under the sector pad key. Next, the data is fed through two diffuser functions, which use a Microsoft-developed algorithm called Elephant. The purpose of these un-keyed functions is solely to increase the probability that modifications to any bits of the ciphertext will cause unpredictable modifications to the entire plaintext sector. Finally, the data is encrypted using AES in CBC mode using the CBC encryption key. The initialization vector is computed by encrypting the byte offset of the sector under the CBC encryption key. We have created a fully-automated demonstration attack called BitUnlocker. It consists of an external USB hard disk containing Linux, a custom SYSLINUX-based bootloader, and a FUSD [ 20 ] filter driver that allows BitLocker volumes to be mounted under Linux. To use BitUnlocker, one first cuts the power to a running Windows Vista system, connects the USB disk, and then reboots the system off of the external drive. BitUnlocker then automatically dumps the memory image to the external disk, runs keyfind on the image to determine candidate keys, tries all combinations of the candidates (for the sector pad key and the CBC encryption key), and, if the correct keys are found, mounts the BitLocker encrypted volume. Once the encrypted volume has been mounted, one can browse it like any other volume in Linux. On a modern laptop with 2 GB of RAM, we found that this entire process took approximately 25 minutes. BitLocker differs from other disk encryption products in the way that it protects the keys when the disk is not mounted. In its default “basic mode,” BitLocker protects the disk's master key solely with the Trusted Platform Module (TPM) found on many modern PCs. This configuration, which may be quite widely used [ 21 ], is particularly vulnerable to our attack, because the disk encryption keys can be extracted with our attacks even if the computer is powered off for a long time. When the machine boots, the keys will be loaded into RAM automatically (before the login screen) without the entry of any secrets. It appears that Microsoft is aware of this problem [ 31 ] and recommends configuring BitLocker in “advanced mode,” where it protects the disk key using the TPM along with a password or a key on a removable USB device. However, even with these measures, BitLocker is vulnerable if an attacker gets to the system while the screen is locked or the computer is asleep (though not if it is hibernating or powered off). FileVault Apple's FileVault disk encryption software has been examined and reverse-engineered in some detail [ 44 ]. In Mac OS X 10.4, FileVault uses 128-bit AES in CBC mode. A user-supplied password decrypts a header that contains both the AES key and a second key k2 used to compute IVs. The IV for a disk block with logical index I is computed as HMAC-SHA1k2(I). We used our EFI memory imaging program to extract a memory image from an Intel-based Macintosh system with a FileVault volume mounted. Our keyfind program automatically identified the FileVault AES key, which did not contain any bit errors in our tests. With the recovered AES key but not the IV key, we can decrypt 4080 bytes of each 4096 byte disk block (all except the first AES block). The IV key is present in memory. Assuming no bits in the IV key decay, an attacker can identify it by testing all 160-bit substrings of memory to see whether they create a plausible plaintext when XORed with the decryption of the first part of the disk block. The AES and IV keys together allow full decryption of the volume using programs like vilefault [ 45 ]. In the process of testing FileVault, we discovered that Mac OS X 10.4 and 10.5 keep multiple copies of the user's login password in memory, where they are vulnerable to imaging attacks. Login passwords are often used to protect the default keychain, which may protect passphrases for FileVault disk images. TrueCrypt TrueCrypt is a popular open-source disk encryption product for the Windows, Mac OS, and Linux platforms. It supports a variety of ciphers, including AES, Serpent, and Twofish. In version 4, all ciphers used LRW mode; in version 5, they use XTS mode (see Section 5.3). TrueCrypt stores a cipher key and a tweak key in the volume header for each disk, which is then encrypted with a separate key derived from a user-entered password. We tested TrueCrypt versions 4.3a and 5.0a running on a Linux system. We mounted a volume encrypted with a 256-bit AES key, then briefly cut power to the system and used our memory imaging tools to record an image of the retained memory data. In both cases, our keyfind program was able to identify the 256-bit AES encryption key, which did not contain any bit errors. For TrueCrypt 5.0a, keyfind was also able to recover the 256-bit AES XTS tweak key without errors. dm-crypt Linux kernels starting with 2.6 include built-in support for dm-crypt, an on-the-fly disk encryption subsystem. The dm-crypt subsystem handles a variety of ciphers and modes, but defaults to 128-bit AES in CBC mode with non-keyed IVs. We tested a dm-crypt volume created and mounted using the LUKS (Linux Unified Key Setup) branch of the cryptsetup utility and kernel version 2.6.20. The volume used the default AES-CBC format. We briefly powered down the system and captured a memory image with our PXE kernel. Our keyfind program identified the correct 128-bit AES key, which did not contain any bit errors. After recovering this key, an attacker could decrypt and mount the dm-crypt volume by modifying the cryptsetup program to allow input of the raw key. Loop-AES Loop-AES is an on-the-fly disk encryption package for Linux systems. In its recommended configuration, it uses a so-called “multi-key-v3” encryption mode, in which each disk block is encrypted with one of 64 encryption keys. By default, it encrypts sectors with AES in CBC mode, using an additional AES key to generate IVs. We configured an encrypted disk with Loop-AES version 3.2b using 128-bit AES encryption in “multi-key-v3” mode. After imaging the contents of RAM, we applied our keyfind program, which revealed the 65 AES keys. An attacker could identify which of these keys correspond to which encrypted disk blocks by performing a series of trial decryptions. Then, the attacker could modify the Linux losetup utility to mount the encrypted disk with the recovered keys. Loop-AES attempts to guard against the long-term memory burn-in effects described by Gutmann [ 23 ] and others. For each of the 65 AES keys, it maintains two copies of the key schedule in memory, one normal copy and one with each bit inverted. It periodically swaps these copies, ensuring that every memory cell stores a 0 bit for as much time as it stores a 1 bit. Not only does this fail to prevent the memory remanence attacks that we describe here, but it also makes it easier to identify which keys belong to Loop-AES and to recover the keys in the presence of memory errors. After recovering the regular AES key schedules using a program like keyfind, the attacker can search the memory image for the inverted key schedules. Since very few programs maintain both regular and inverted key schedules in this way, those keys are highly likely to belong to Loop-AES. Having two related copies of each key schedule provides additional redundancy that can be used to identify which bit positions are likely to contain errors. Memory imaging attacks are difficult to defend against because cryptographic keys that are in active use need to be stored somewhere. Our suggested countermeasures focus on discarding or obscuring encryption keys before an adversary might gain physical access, preventing memory-dumping software from being executed on the machine, physically protecting DRAM chips, and possibly making the contents of memory decay more readily. Scrubbing memory Countermeasures begin with efforts to avoid storing keys in memory. Software should overwrite keys when they are no longer needed, and it should attempt to prevent keys from being paged to disk. Runtime libraries and operating systems should clear memory proactively; Chow et al. show that this precaution need not be expensive [ 13 ]. Of course, these precautions cannot protect keys that must be kept in memory because they are still in use, such as the keys used by encrypted disks or secure web servers. Systems can also clear memory at boot time. Some PCs can be configured to clear RAM at startup via a destructive Power-On Self-Test (POST) before they attempt to load an operating system. If the attacker cannot bypass the POST, he cannot image the PC's memory with locally-executing software, though he could still physically move the memory chips to different computer with a more permissive BIOS. Limiting booting from network or removable media Many of our attacks involve booting a system via the network or from removable media. Computers can be configured to require an administrative password to boot from these sources. We note, however, that even if a system will boot only from the primary hard drive, an attacker could still swap out this drive, or, in many cases, reset the computer's NVRAM to re-enable booting from removable media. Suspending a system safely Our results show that simply locking the screen of a computer (i.e., keeping the system running but requiring entry of a password before the system will interact with the user) does not protect the contents of memory. Suspending a laptop's state (“sleeping”) is also ineffective, even if the machine enters screen-lock on awakening, since an adversary could simply awaken the laptop, power-cycle it, and then extract its memory state. Suspending-to-disk (“hibernating”) may also be ineffective unless an externally-held secret is required to resume normal operations. With most disk encryption systems, users can protect themselves by powering off the machine completely when it is not in use. (BitLocker in “basic” TPM mode remains vulnerable, since the system will automatically mount the disk when the machine is powered on.) Memory contents may be retained for a short period, so the owner should guard the machine for a minute or so after removing power. Though effective, this countermeasure is inconvenient, since the user will have to wait through the lengthy boot process before accessing the machine again. Suspending can be made safe by requiring a password or other external secret to reawaken the machine, and encrypting the contents of memory under a key derived from the password. The password must be strong (or strengthened), as an attacker who can extract memory contents can then try an offline password-guessing attack. If encrypting all of memory is too expensive, the system could encrypt only those pages or regions containing important keys. Some existing systems can be configured to suspend safely in this sense, although this is often not the default behavior [ 5 ]. Avoiding precomputation Our attacks show that using precomputation to speed cryptographic operations can make keys more vulnerable. Precomputation tends to lead to redundant storage of key information, which can help an attacker reconstruct keys in the presence of bit errors, as described in Section 5. Avoiding precomputation may hurt performance, as potentially expensive computations will be repeated. (Disk encryption systems are often implemented on top of OS- and drive-level caches, so they are more performance-sensitive than might be assumed.) Compromises are possible; for example, precomputed values could be cached for a predetermined period of time and discarded if not re-used within that interval. This approach accepts some vulnerability in exchange for reducing computation, a sensible tradeoff in some situations. Key expansion Another defense against key reconstruction is to apply some transform to the key as it is stored in memory in order to make it more difficult to reconstruct in the case of errors. This problem has been considered from a theoretical perspective; Canetti et al. [ 11 ] define the notion of an exposure-resilient function whose input remains secret even if all but some small fraction of the output is revealed, and show that the existence of this primitive is equivalent to the existence of one-way functions. In practice, suppose we have a key K which is not currently in use but will be needed later. We cannot overwrite the key but we want to make it more resistant to reconstruction. One way to do this is to allocate a large B-bit buffer, fill the buffer with random data R, then store K ⊕ H(R) where H is a hash function such as SHA-256. Now suppose there is a power-cutting attack which causes d of the bits in this buffer to be flipped. If the hash function is strong, the adversary must search a space of size B/2 + d d to discover which bits were flipped of the roughly B/2 that could have decayed. If B is large, this search will be prohibitive even when d is relatively small. In principle, all keys could be stored in this way, recomputed when in use, and deleted immediately after. Alternatively, we could sometimes keep keys in memory, introducing the precomputation tradeoff discussed above. For greater protection, the operating system could perform tests to identify memory locations that are especially quick to decay, and use these to store key material. Physical defenses Some of our attacks rely on physical access to DRAM chips or modules. These attacks can be mitigated by physically protecting the memory. For example, DRAM modules could be locked in place inside the machine, or encased in a material such as epoxy to frustrate attempts to remove or access them. Similarly, the system could respond to low temperatures or opening of the computer's case by attempting to overwrite memory, although these defenses require active sensor systems with their own backup power supply. Many of these techniques are associated with specialized tamper-resistant hardware such as the IBM 4758 coprocessor [ 18 , 41 ] and could add considerable cost to a PC. However, a small amount of memory soldered to a motherboard could be added at relatively low cost. Architectural changes Some countermeasures try to change the machine's architecture. This will not help on existing machines, but it might make future machines more secure. One approach is to find or design DRAM systems that lose their state quickly. This might be difficult, given the tension between the desire to make memory decay quickly and the desire to keep the probability of decay within a DRAM refresh interval vanishingly small. Another approach is to add key-store hardware that erases its state on power-up, reset, and shutdown. This would provide a safe place to put a few keys, though precomputation of derived keys would still pose a risk. Others have proposed architectures that would routinely encrypt the contents of memory for security purposes [ 28 , 27 , 17 ]. These would apparently prevent the attacks we describe, as long as the encryption keys were destroyed on reset or power loss. Encrypting in the disk controller Another approach is to encrypt data in the hard disk controller hardware, as in Full Disk Encryption (FDE) systems such as Seagate's “DriveTrust” technology [ 38 ]. In its basic form, this approach uses a write-only key register in the disk controller, into which the software can write a symmetric encryption key. Data blocks are encrypted, using the key from the key register, before writing to the disk. Similarly, blocks are decrypted after reading. This allows encrypted storage of all blocks on a disk, without any software modifications beyond what is required to initialize the key register. This approach differs from typical disk encryption systems in that encryption and decryption are done by the disk controller rather than by software in the main CPU, and that the main encryption keys are stored in the disk controller rather than in DRAM. To be secure, such a system must ensure that the key register is erased whenever a new operating system is booted on the computer; otherwise, an attacker can reboot into a malicious kernel that simply reads the disk contents. For similar reasons, the system must also ensure that the key register is erased whenever an attacker attempts to move the disk controller to another computer (even if the attacker maintains power while doing so). Some systems built more sophisticated APIs, implemented by software on the disk controller, on top of this basic facility. Such APIs, and their implementation, would require further security analyses. We have not evaluated any specific systems of this type. We leave such analyses for future work. Trusted computing Trusted Computing hardware, in the form of Trusted Platform Modules (TPMs) [ 42 ] is now deployed in some personal computers. Though useful against some attacks, today's Trusted Computing hardware does not seem to prevent the attacks described here. Deployed TCG TPMs do not implement bulk encryption. Instead, they monitor boot history in order to decide (or help other machines decide) whether it is safe to store a key in RAM. If a software module wants to use a key, it can arrange that the usable form of that key will not be stored in RAM unless the boot process has gone as expected [ 31 ]. However, once the key is stored in RAM, it is subject to our attacks. TPMs can prevent a key from being loaded into memory for use, but they cannot prevent it from being captured once it is in memory. Contrary to popular belief, DRAMs hold their values for surprisingly long intervals without power or refresh. Our experiments show that this fact enables a variety of security attacks that can extract sensitive information such as cryptographic keys from memory, despite the operating system's efforts to protect memory contents. The attacks we describe are practical—for example, we have used them to defeat several popular disk encryption systems. Other types of software may be similarly vulnerable. DRM systems often rely on symmetric keys stored in memory, which may be recoverable using the techniques outlined in our paper. As we have shown, SSL-enabled web servers are vulnerable, since they often keep in memory private keys needed to establish SSL sessions. Furthermore, methods similar to our key-finder would likely be effective for locating passwords, account numbers, or other sensitive data in memory. There seems to be no easy remedy for these vulnerabilities. Simple software changes have benefits and drawbacks; hardware changes are possible but will require time and expense; and today's Trusted Computing technologies cannot protect keys that are already in memory. The risk seems highest for laptops, which are often taken out in public in states that are vulnerable to our attacks. These risks imply that disk encryption on laptops, while beneficial, does not guarantee protection. Ultimately, it might become necessary to treat DRAM as untrusted, and to avoid storing sensitive data there, but this will not be feasible until architectures are changed to give software a safe place to keep its keys. We thank Andrew Appel, Jesse Burns, Grey David, Laura Felten, Christian Fromme, Dan Good, Peter Gutmann, Benjamin Mako Hill, David Hulton, Brie Ilenda, Scott Karlin, David Molnar, Tim Newsham, Chris Palmer, Audrey Penven, David Robinson, Kragen Sitaker, N.J.A. Sloane, Gregory Sutter, Sam Taylor, Ralf-Philipp Weinmann, and Bill Zeller for their helpful comments, suggestions, and contributions. Without them, this paper would not have been possible. This material is based in part upon work supported under a National Science Foundation Graduate Research Fellowship. Any opinions, findings, conclusions or recommendations expressed in this publication are those of the authors and do not necessarily reflect the views of the National Science Foundation. Calandrino performed this research under an appointment to the Department of Homeland Security (DHS) Scholarship and Fellowship Program, administered by the Oak Ridge Institute for Science and Education (ORISE) through an interagency agreement between the U.S. Department of Energy (DOE) and DHS. ORISE is managed by Oak Ridge Associated Universities (ORAU) under DOE contract number DE-AC05-06OR23100. All opinions expressed in this paper are the author's and do not necessarily reflect the policies and views of DHS, DOE, or ORAU/ORISE. Advanced Encryption Standard. National Institute of Standards and Technology, FIPS-197, Nov. 2001. Anderson, R. Security Engineering: A Guide to Building Dependable Distributed Systems, first ed. Wiley, Jan. 2001, p. 282. Anvin, H. P. SYSLINUX. http://syslinux.zytor.com/. Arbaugh, W., Farber, D., and Smith, J. A secure and reliable bootstrap architecture. In Proc. IEEE Symp. on Security and Privacy (May 1997), pp. 65–71. Bar-Lev, A. Linux, Loop-AES and optional smartcard based disk encryption. http://wiki.tuxonice.net/EncryptedSwapAndRoot, Nov. 2007. Barry, P., and Hartnett, G. Designing Embedded Networking Applications: Essential Insights for Developers of Intel IXP4XX Network Processor Systems, first ed. Intel Press, May 2005, p. 47. Blömer, J., and May, A. New partial key exposure attacks on RSA. In Proc. CRYPTO 2003 (2003), pp. 27–43. Boileau, A. Hit by a bus: Physical access attacks with Firewire. Presentation, Ruxcon, 2006. Boneh, D., Durfee, G., and Frankel, Y. An attack on RSA given a small fraction of the private key bits. In Advances in Cryptology – ASIACRYPT '98 (1998), pp. 25–34. California Statutes. Cal. Civ. Code §1798.82, created by S.B. 1386, Aug. 2002. Canetti, R., Dodis, Y., Halevi, S., Kushilevitz, E., and Sahai, A. Exposure-resilient functions and all-or-nothing transforms. In Advances in Cryptology – EUROCRYPT 2000 (2000), vol. 1807/2000, pp. 453–469. Carrier, B. D., and Grand, J. A hardware-based memory acquisition procedure for digital investigations. Digital Investigation 1 (Dec. 2003), 50–60. Chow, J., Pfaff, B., Garfinkel, T., and Rosenblum, M. Shredding your garbage: Reducing data lifetime through secure deallocation. In Proc. 14th USENIX Security Symposium (Aug. 2005), pp. 331–346. Coppersmith, D. Small solutions to polynomial equations, and low exponent RSA vulnerabilities. J. Cryptology 10, 4 (1997), 233–260. Dornseif, M. 0wned by an iPod. Presentation, PacSec, 2004. Dornseif, M. Firewire – all your memory are belong to us. Presentation, CanSecWest/core05, May 2005. Dwoskin, J., and Lee, R. B. Hardware-rooted trust for secure key management and transient trust. In Proc. 14th ACM Conference on Computer and Communications Security (Oct. 2007), pp. 389–400. Dyer, J. G., Lindemann, M., Perez, R., Sailer, R., van Doorn, L., Smith, S. W., and Weingart, S. Building the IBM 4758 secure coprocessor. Computer 34 (Oct. 2001), 57–66. Eckstein, K., and Dornseif, M. On the meaning of `physical access' to a computing device: A vulnerability classification of mobile computing devices. Presentation, NATO C3A Workshop on Network-Enabled Warfare, Apr. 2005. Elson, J., and Girod, L. Fusd – a Linux framework for user-space devices. http://www.circlemud.org/ jelson/software/fusd/. Ferguson, N. AES-CBC + Elephant diffuser: A disk encryption algorithm for Windows Vista. http://www.microsoft.com/downloads/details.aspx?FamilyID=131dae03-39ae-% 48be-a8d6-8b0034c92555, Aug. 2006. Gutmann, P. Secure deletion of data from magnetic and solid-state memory. In Proc. 6th USENIX Security Symposium (July 1996), pp. 77–90. Gutmann, P. Data remanence in semiconductor devices. In Proc. 10th USENIX Security Symposium (Aug. 2001), pp. 39–54. IEEE 1619 Security in Storage Working Group. IEEE P1619/D19: Draft standard for cryptographic protection of data on block-oriented storage devices, July 2007. Intel Corporation. Preboot Execution Enviroment (PXE) specification version 2.1, Sept. 1999. Kent, C. Draft proposal for tweakable narrow-block encryption. https://siswg.net/docs/LRW-AES-10-19-2004.pdf, 2004. Lee, R. B., Kwan, P. C., McGregor, J. P., Dwoskin, J., and Wang, Z. Architecture for protecting critical secrets in microprocessors. In Proc. Intl. Symposium on Computer Architecture (2005), pp. 2–13. Lie, D., Thekkath, C. A., Mitchell, M., Lincoln, P., Boneh, D., Mitchell, J., and Horowitz, M. Architectural support for copy and tamper resistant software. In Symp. on Architectural Support for Programming Languages and Operating Systems (2000), pp. 168–177. Link, W., and May, H. Eigenschaften von MOS-Ein-Transistorspeicherzellen bei tiefen Temperaturen. Archiv für Elektronik und Übertragungstechnik 33 (June 1979), 229–235. Liskov, M., Rivest, R. L., and Wagner, D. Tweakable block ciphers. In Advances in Cryptology – CRYPTO 2002 (2002), pp. 31–46. MacIver, D. Penetration testing Windows Vista BitLocker drive encryption. Presentation, Hack In The Box, Sept. 2006. National Conference of State Legislatures. State security breach notification laws. http://www.ncsl.org/programs/lis/cip/priv/breachlaws.htm, Jan. 2008. Pettersson, T. Cryptographic key recovery from Linux memory dumps. Presentation, Chaos Communication Camp, Aug. 2007. Ptacek, T. Recover a private key from process memory. http://www.matasano.com/log/178/recover-a-private-key-from-process-memory/. Rogaway, P. Efficient instantiations of tweakable blockciphers and refinements to modes OCB and PMAC. In Advances in Cryptology – ASIACRYPT 2004 (2004), pp. 16–31. RSA Laboratories. PKCS #1 v2.1: RSA cryptography standard. ftp://ftp.rsasecurity.com/pub/pkcs/pkcs-1/pkcs-1v2-1.pdf. Scheick, L. Z., Guertin, S. M., and Swift, G. M. Analysis of radiation effects on individual DRAM cells. IEEE Transactions on Nuclear Science 47 (Dec. 2000), 2534–2538. Seagate Corporation. Drivetrust technology: A technical overview. http://www.seagate.com/docs/pdf/whitepaper/TP564\_DriveTrust\_Oct06.pdf% . Shamir, A., and van Someren, N. Playing “hide and seek” with stored keys. Lecture Notes in Computer Science 1648 (1999), 118–124. Skorobogatov, S. Low-temperature data remanence in static RAM. University of Cambridge Computer Laborary Technical Report No. 536, June 2002. Smith, S. W. Trusted Computing Platforms: Design and Applications, first ed. Springer, 2005. Trusted Computing Group. Trusted Platform Module specification version 1.2, July 2007. Vidas, T. The acquisition and analysis of random access memory. Journal of Digital Forensic Practice 1 (Dec. 2006), 315–323. Weinmann, R.-P., and Appelbaum, J. Unlocking FileVault. Presentation, 23rd Chaos Communication Congress, Dec. 2006. Weinmann, R.-P., and Appelbaum, J. VileFault. http://vilefault.googlecode.com/, Jan. 2008. Wyns, P., and Anderson, R. L. Low-temperature operation of silicon dynamic random-access memories. IEEE Transactions on Electron Devices 36 (Aug. 1989), 1423–1428.